This picture became popular on facebook and everyone was outraged to see that Iowa was one of the worst states when it comes to laws protecting our companion animals. While it is a shocking fact, it has sadly been this way for many years. When I spoke at ISU, I highlighted these laws and spoke about how they are a national disgrace (especially paired with the number of commercial dog breeders we have– around 250!). Now I want to highlight the laws that barely protect our companion animals. As an added bonus, I will add definitions and compare our laws side by side with the laws from one of the best states to be an animal, Illinois. Not only is it important for our laws to be accessible for everyone, but everyone should be able to understand them. Animal Neglect- A person who impounds or confines an animal without adequate food, water or shelter. Animal Torture- A person is guilty of animal torture if the person inflicts upon the animal severe physical pain with a depraved or sadistic intent to cause prolonged suffering or death. Aggravated Cruelty- A person commits aggravated cruelty to animals when, (with no justifiable purpose), the person intentionally kills or causes serious physical injury to the animal. Now to look at our laws compared to the laws from a far superior state! Animal Torture- same penalty as mentioned before, and psychological treatment. Animal Torture- would receive the same fine, imprisonment from 2-5 years, one year probation, and a mandatory psychiatric evaluation. If you are an animal lover, you look at this comparison and shake your head. Iowa fails in comparison to other states. Especially since most of the criminals aren’t punished to the fullest extent of the law. They are let off with a “slap of the wrist” most of the time. Why are we allowing these lax laws to remain while abused animals suffer? Sadly, there is one huge reason why Iowa is so behind the times… Agriculture… Farmers and other livestock owners have been instructed to vote against any “animal friendly” piece of legislation. 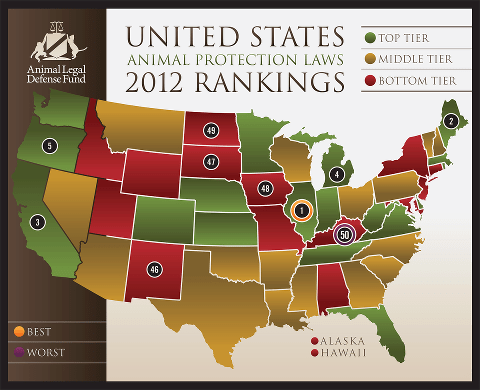 (Places like Farm Bureau are actively against animal welfare organizations) This is why it is hard to get new laws passed. They think that laws protecting dogs will trickle down to laws protecting hogs. It is really sad. If you honestly suspect animal neglect, according to Iowa Code 717B.2, you should contact your local sheriff and ask them to perform a wellness check on the animal. Don’t leave it up to someone else. YOU should be the one making the call! If you are interested in learning more about what Iowa ignores, click here. If you liked this article, please like our facebook page!